After a good passage from Niue we anchored in a beautiful spot where INFINITY, ROGUE and MONKEY ISLAND were already waiting for us. We went on land to have some drinks together. ROGUE had already spent some time in Vava’u and was planning to move South the next day. Our plan was to clear in in Neiafu the next day and register us for the Vava’u Bluewater Festival as the weather forecast for the coming week did not look very promising. 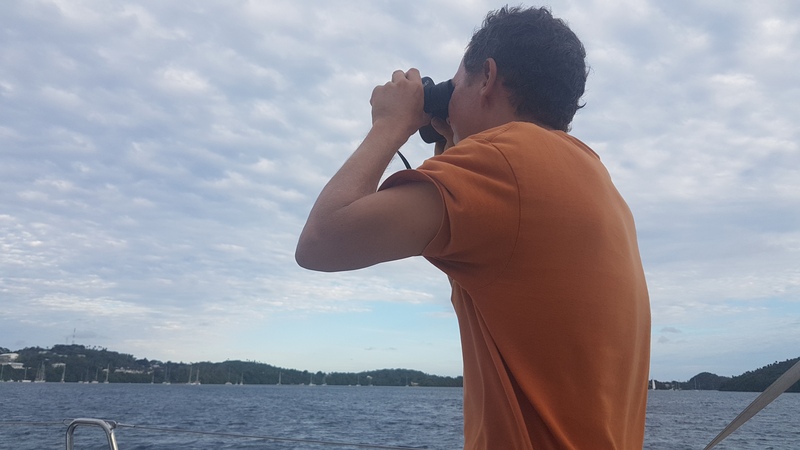 The whole following week would be rainy and very windy, so not really the right weather to check out the beautiful anchorages in the Vava’u island group. As Tonga is one of the rare places where you are allowed to swim with humpback whales we where hoping to get a chance before the stormy weather aŕrives. Even for Karin who has seen a lot of underwater life this was something very special. There is of course no guarantee when you book the trip that you actually will be able to snorkel close to one of these beautiful mammals. We cruised around for quite a long time and on the first attempt the whale moved on too fast. But a little bit later we were lucky. Our guide gave us directions where to swim and we had the chance to see a mother whale with her calf just next to us… an unforgettable moment! Swimming with the whales… beautiful….. but what if she moves now a little bit more towards us? The cruising festival was a great thing. It was organised by a few local businesses together with New Zealands Customs , Bay of Islands and Whangarei Marina. It really made appetite for New Zealand! The organizers were all very friendly and helpful. The ladies from customs and biosecurity explained us what we had to exspect at the c-dock. They also distributed a documentation with all the necessary forms which was very useful. 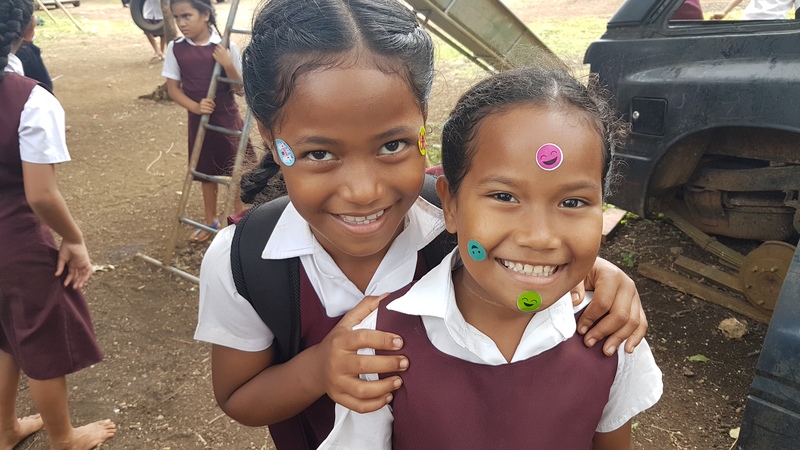 One of the highlights of the festival was the visit of Hosea Primary School where the children did some beautiful singing and dancing performances. After a delicious local lunch (made by the kids parents) the kids could play together. 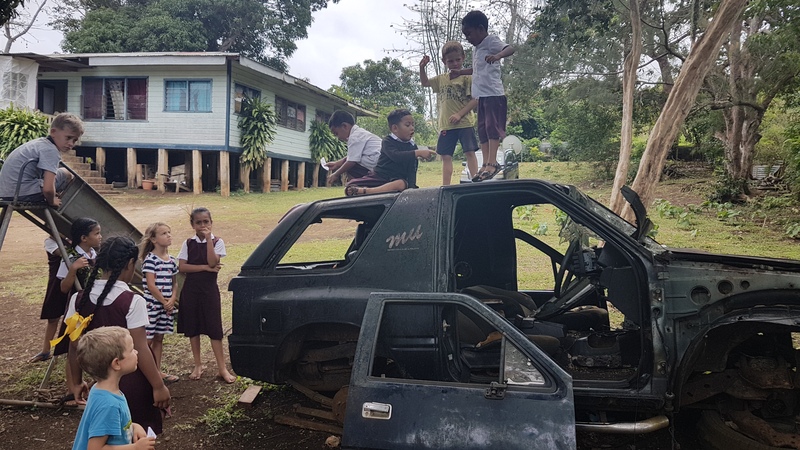 The kids playground looked a little bit different… one of the biggest attractions was an old car with a broken window. You would never find that on a playground in Switzerland..
And of course there were also some regattas. First there was the Friday race. Light winds – perfect for us. The whole BAJKA crew was on boat. Lukas, who sailed for Switzerland at the Olympics in Sydney 2000 was our secret weapon… and we won! There was a party in the evening where we saw our friends from CHASING STARS and TODAY again who were just about to leave for Fidji. It was a fun night and great to see them again. Next regatta was the Wednesday race… there was a lot of wind and we got slightly beaten by our challenger ZENSATION, who was second in the first race. We had a bit more healing than usual and parts of the crew were busy downstairs with bailing out the water which entered through the sink because we had forgotten to close the seacocks. What a beginners mistake…. But Lukas and André stayed calm and the finish was very tight. We were second in the monohull category and won 5 days in the Bay of Islands Marina in Opua, New Zealand for the cleanest hull – as one can see on the pictures below ;-).The last regatta was the weekly Friday race again… this time with no women and no kids on board but also with no wind and no luck ;-). All in all these races were good fun for us and it was particularly interesting to share Lukas’ knowledge and experience. After the cruising festival we said goodbye to INFINITY who headed towards Fidji and sailed further south to the Ha’apai Island group. We first thought that we are just staying for a short stop over and then continue towards Nuku’alofa to drop Karin off but then a perfect weather window for New Zealand started to develop! Who would have thought, that Karin would join us for this passage! 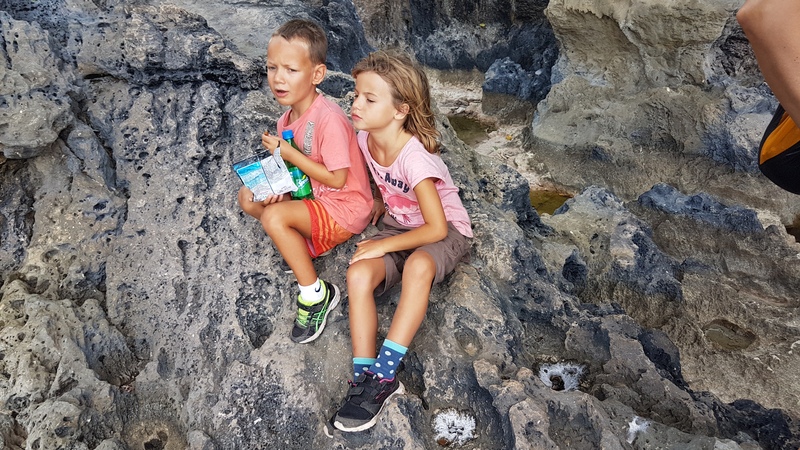 We anchored on a beautiful remote island together with BAIJKA and PELIZENO, had a beautiful walk around the island on my Birthday and got ready for the passage. We would have loved to stay a bit longer, but the weather window was just too good… we could not expect anythinģ better. 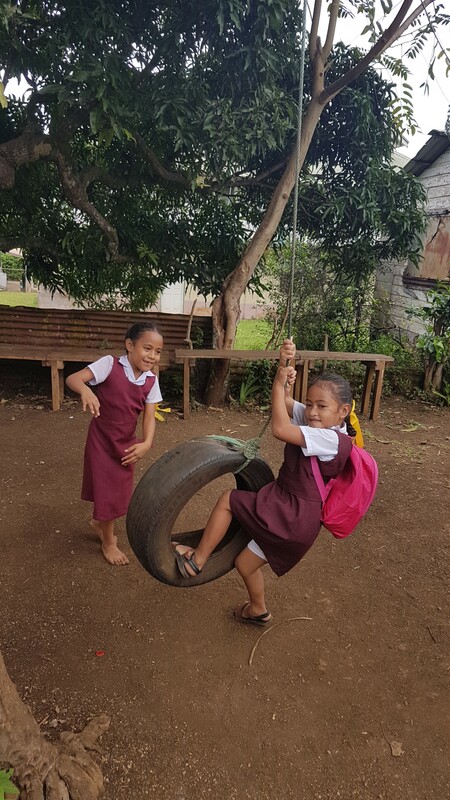 Goodbye Tonga – New Zealand here we come! You probably do not know where Niue is . To be honest we did not know much about it either. We were looking for a place where Karin could join us after her diving trip on the “French Polynesian Master” and Tonga turned out to be too complicated. So the plan was that she would meet us in Niue. Niue is a small island in the South Pacific Ocean to the east of Tonga. It has an area of 260 square kilometres and a coastline of 64 km. It is one of the world’s largest coral island. Niue is a self-governing state in free association with New Zealand. There are about 1600 people living on the island. BAJKA was already waiting for us in Alofi. As we haven’t seen them since Fakarava we were looking forward to catch up with them. INFINITY had arrived just a few hours before us. We had left Maupelia together and had stayed in contact on the passage. On a windless day we even managed to meet for a swim in the middle of nowhere. We wanted the kids to have some fun in the water together as we knew that the rest of the passage was going to be very windy and rainy. Karin had arrived already a day before us in Niue and had booked a room in a hotel. 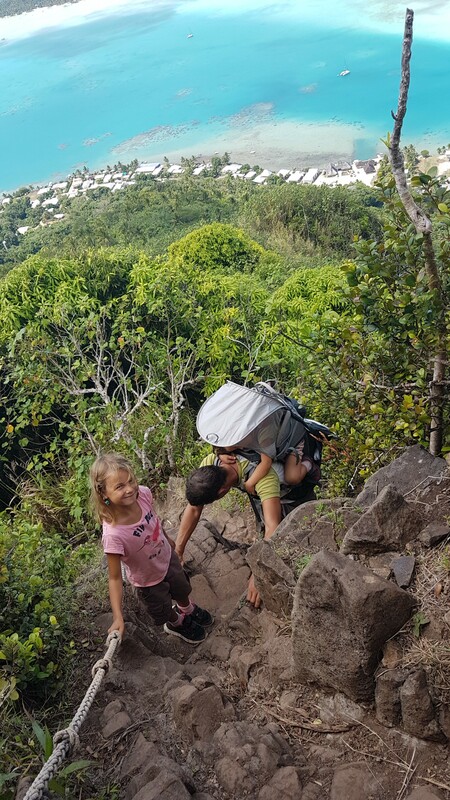 The haul out lift for the dinghy was a bit unusual at the beginning but we got used to it quickly and Jaël and Amina were quite excited about this new procedure. Clearing in was very easy and uncomplicated. Niue is known for whale watching and diving. There are beautiful caves and chasms waiting to be explored and the water is very clear. The people are very friendly and as soon as they see you walking along the street they offer you a lift. No matter you want it or not. We hired a car and drove together with INFINITY in moderate speed (driving zigzag around the holes in the road) to the Avaiki Cave. It was a picture perfect scenery and we enjoyed a refreshing swim in the cristal clear turquoise water. Afterwards we continued to Talava Arches and had a snorkel later on in the beautiful Limu pools. The next day we went diving and it was spectacular. Quite adventurous for a new born PADI Open water diver but all went well. We had the opportunity to dive in a cave and in a chasm. This was something completely different! We saw plenty of water snakes which we have not seen in French Polynesia at all. The visibility was outstanding. 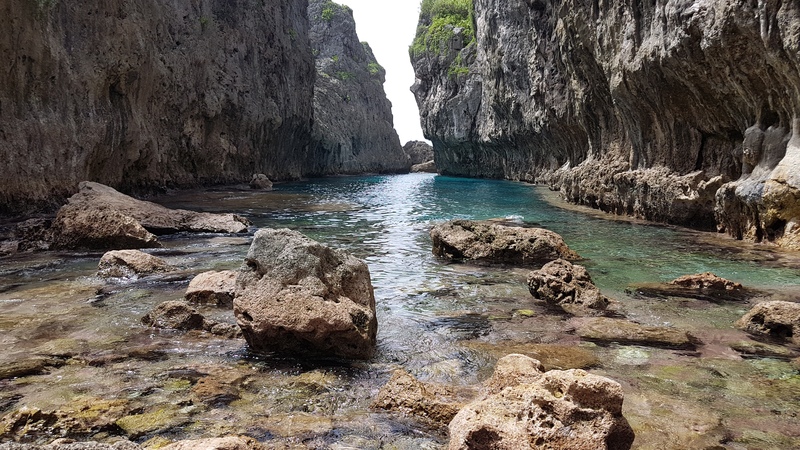 Niue is a lone island in the pacific and, being a coral island, it does not have much soil and runoff. This are key ingrediences for world class visibility. On the anchorage we could even see whales right behind Mirabella. Once Jaël and Amina were with BAJKA in the dinghy and saw one very close. Humpback whales in the southern hemisphere spend the summer feeding down in the waters around Antarctica and thèn spend the winter migrating north past New Zealand to the tropical South Pacific for breeding – most commonly around Niue and Tonga. We were really positively surprised by this small island and would warmly recommend it to other cruisers. For us time had come to say goodbye , next stop was Tonga, where we possibly would meet ROGUE and CHASING STARS again. Papeete on Tahiti was our first town since Panama. Some people say it is loud and noisy but for a change we liked it. Especially the lively market hall and the square with the roulottes restaurants, where you could get all kind of different street food for little money. It was a pleasure for us to welcome Loni again and of course Jaël and Amina where very excited to see her. They enjoyed strolling around with her in the beautiful park along the waterside and of course had to try out all the playgrounds. We haven’t come across any playground since Panama – if you don’t count the beautiful beaches with hermit crabs and a thousand other things to discover. Being in a big marina after sailing several months in remote places means also having a big to-do-list waiting to be done. So while the kids were enjoying Papeete’s playgrounds we were busy working us through our list. We managed to get some tickets for the last day at the Heiva which is Tahiti’s biggest festival. Amina fell asleep after a while but Jaël enjoyed the show together with Alyssa and her sisters from CHASING STARS. We were deeply impressed by the dance performances and the beautiful costumes. Just when we were done with all our jobs we heard that the diving boat FRENCH POLINESIA MASTER will come to Papeete the next day. Our former crew Marine worked there as a dive master and so we decided to stay and meet her for probably the last time. Mauro was also in Papeete so we invited both for a farewell dinner on Mirabella. It was a good evening and the kids really enjoyed to see them both again. Next day we finally set sails for Moorea which was only about a 3 hours sail away. As it was her day off Marine decided to join us and return to Tahiti with the evening ferry. The Society Islands are the ideal combination of Marquesas and Tuamotus. They have beautiful green hills and mountains like the Marquesas and lagoons with turquoise clear water and palm trees like the Tuamotus. 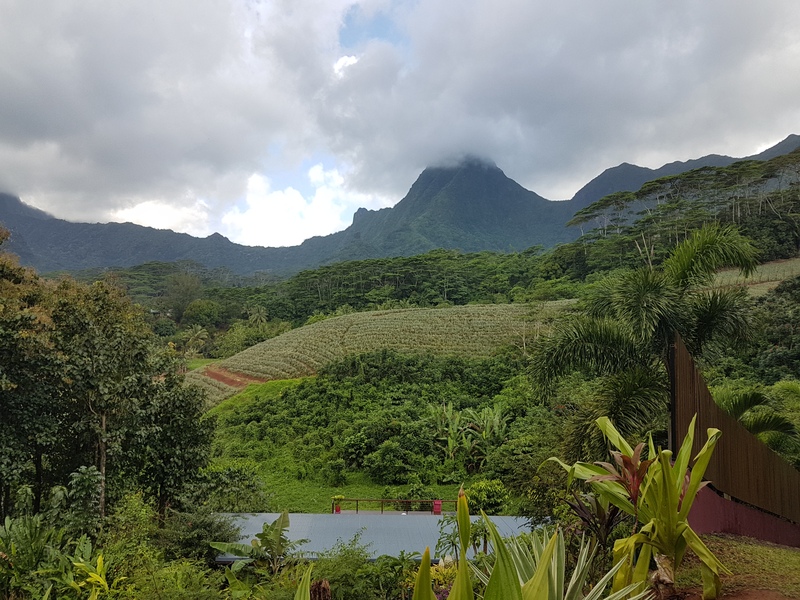 Moorea’s scenery is stunning and together with CHASING STARS we enjoyed the beautiful pineapple plantation walk. I never tasted pineapple as good as the ones I bought in Moorea. They were simply delicious. 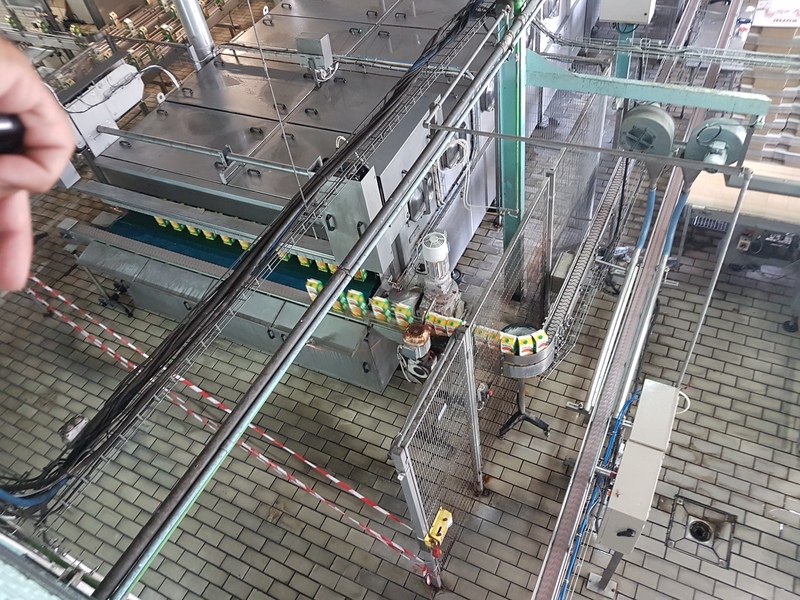 Next day we visited the Rotui juice factory which was also for the kids very interesting to see. We lifted the anchor and joined INFINITY at the Tiki anchorage near the place where you could pet the sting rays. After beeing almost four weeks with us Loni had to fly back home. It was so nice to have her again with us on Mirabella. We all enjoyed her company. She took the ferry to Papeete and we left Moorea for Raiatea, where ROGUE was already waiting for us. In Raiatea we made a river tour with our dinghy together with Josh and the ROGUE boys. 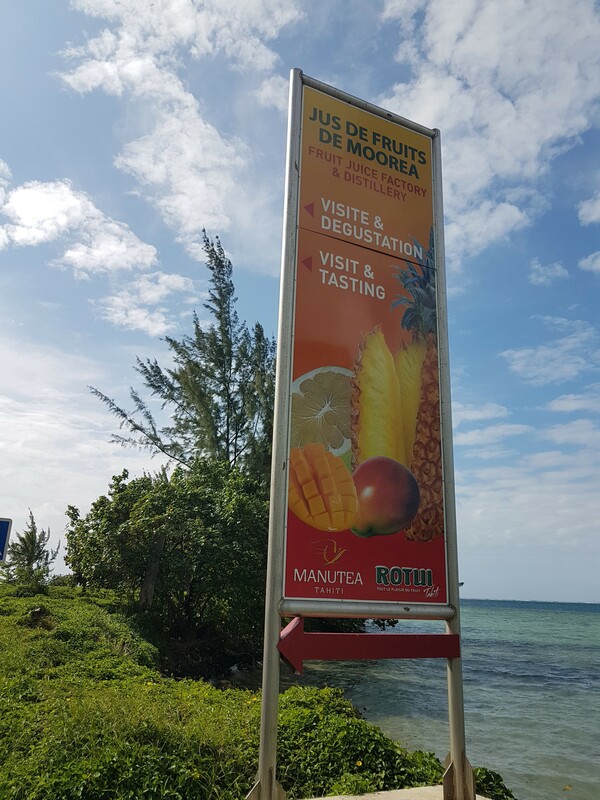 A local guy overtook us in a kajak and asked if we would like to buy some fruit. 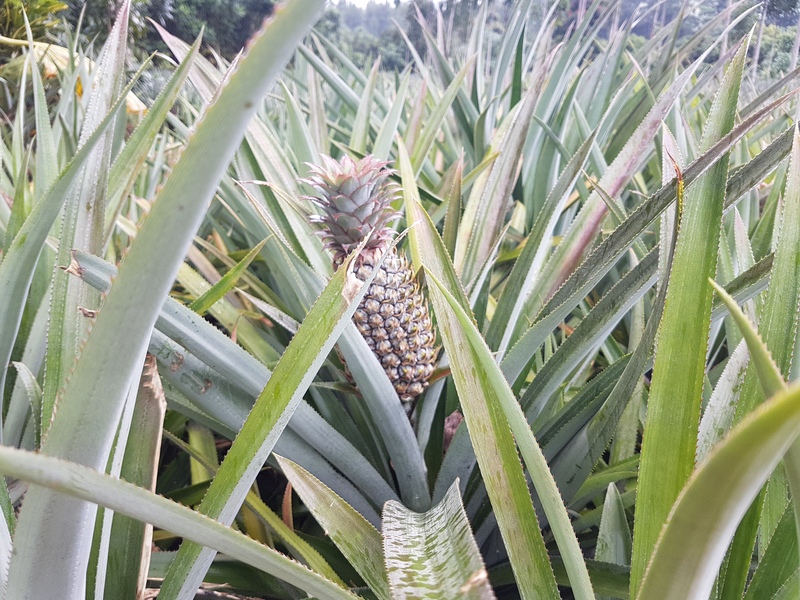 He asked us to follow him and gave us a tour through the whole plantation. He showed us all sort of different fruits, climbed up the trees to pick them and let us taste. It was so interesting and you could see that he was really proud of it. On our way back it was pouring and we were completely wet when we got back on our boat. What a beautiful excursion! Later that afternoon the weather cleared up and we changed to a beautiful anchorage in the shelter of a small uninhabited palm tree island. It was an idyllic place for a swim the next morning. We continued North and anchored in Taha’a close to a beautiful coral garden where we could snorkel with the current. A perfect snorkel spot for the kids and we had a lot of fun together with CHASING STARS and ROGUE. The next day we were invited to Mana’s Birthday party, a nice guy André met on his jogging tour, while we were visiting a pearlfarm and a rhum distillerie. Mana celebrated his birthday on the small island were we were ancored nearby. He surprised us all with a spectacular firedance! After a while, we once more said Goodbye to CHASING STARS an ROGUE. They continued to sail to Suvarov and we wanted to stop in Maupiti. After a very rainy passage with uncomfortable waves we got ready for our first atoll. We had chosen Makemo because we heard that it is a nice island and the pass seemed to be not too challenging. Ideal choice for atoll greenhorns like us. André’s planning was excellent and the pass was really no big deal. We anchored close to Pouheva village and soon jumped into the dinghy to explore the village. When we arrived in the small harbour we saw two fishermen cleaning their catch of the day. I just wanted to ask them if we could leave the dinghy there and started talking with them. They generously offered us two nice groupers as a gift. What a warm welcome! We soon discovered that the main method of transport on this island were bicycles. A very peaceful atmosphere. No one passed without a friendly “Ia Orana”. While André and Mauro tried to get some internet in front of the supermarket, me and the kids went on exploring the village. We heard some nice music and went to have a look where it came from. We came to a backyard where a group of women where training a Polynesian Dance performance for the Heiva festival in July. It was fantastic to watch them perform and Jaël and Amina liked it as well. As the wind had calmed down we planned to change anchorage. We moved to a beautiful and very remote spot west of Pouheva. When you move inside these atolls you have to be very careful. One has always stand on the bow spotting the coral heads. It was like a postcard picture scenery of Polynesia. A beautiful beach with palm trees and a lot of hermit crabs. We met a family on the motu who just arrived to do copra farming. They come here twice a year for about 4-6 weeks. 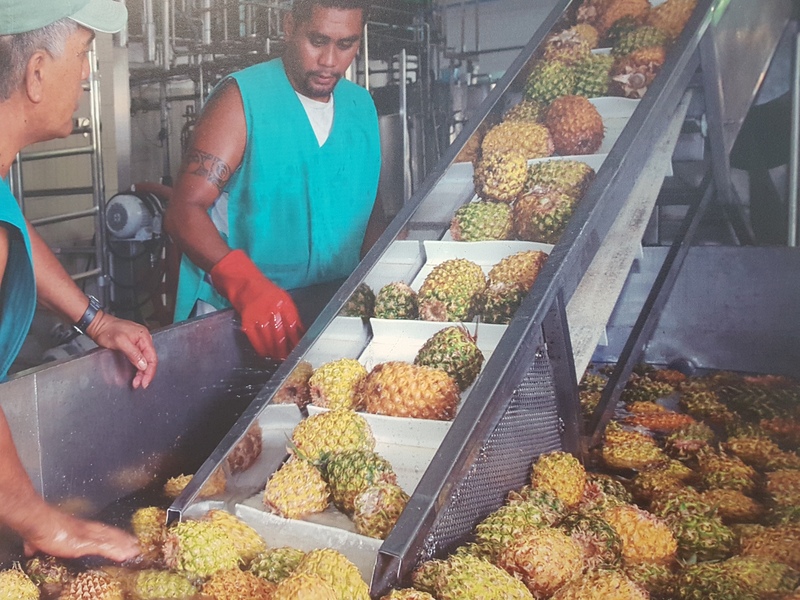 The dried coconuts are sold in Tahiti for Monoi oil production, cosmetics and food industry. The family was very friendly and showed us how to weave some hats out of coconut palm leaves. We spent the days with spearfishing, snorkelling and swimming and it was the perfect place for Jaël to practice on the SUP. Our second atoll was Fakarava – every divers dream – and the beautiful atoll where I was going to do my PADI Open Water certificate. BAJKA, another Swiss boat with two boys was already waiting there for us. Who would have thought that we would sail together to New Zealand with these guys. We rented some bicycles the next day and cycled together to Hinano Pearl Farm, where we were introducüed into the secret of pearl farming. Fakarava is truly one of the most beautiful spots on earth, especially when you like diving. The visibility under water is incredible and the variety of fish is fantastic. After being excited seeing my first shark while diving I soon realized, that there are heaps of them and I gave up counting. But the majestic smooth passing of a manta ray is something I will never forget and will always remain special no matter how many of them you have already seen. After I had succsessfully made my PADI Open water we moved to the south pass together with CHASING STARS. ROGUE had moved there already earlier. We did an amazing snorkel in the pass all together the next day, letting us drift with the current. It was just fantastic! To hide from some forecasted stronger wind we all moved to Hirifa the next day, an anchorage where we had better protection. After a month in beautiful Fakarava we left for Toao which was another atoll just 10 miles away. Getting in was easy but getting out turned out to be a bit more tricky. André and Chris from CHASING STARS checked out the pass before but although it should have been the right time the pass did not look quiet at all. Finally we decided just to go and it was a very wild and bumpy ride. 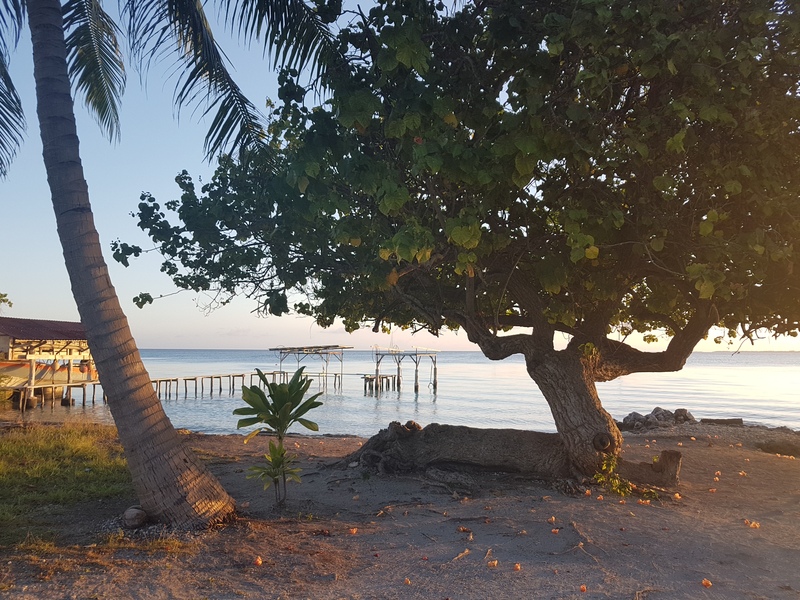 Goodbye beautiful Tuamotus! Arriving in Fatu Hiva in the sunrise after 16.5 days on sea was simply magic. I think we will never forget this beautiful morning with that stunning scenery. It was simply breathtaking. The bay of virgins is the most scenic place you can imagine. When we arrived there were just a handful of other boats anchored there. We were welcomed by Max (a dutch solo sailor) who brought us some juicy pamplemousse from the island. They were delicious and tasted like paradise… surely also because our fruit reserve was down to zero after the crossing. Max also gave us a lot of useful informations about the village of Hanavave. After a nice pancake breakfast we got ready to discover the small village of Hanavave . Technically you would say there was not much to discover. There was a church, a tiny small shop (who just accepted French Polynesian Francs which we did not have), a post office and a mairie. No restaurant, no ATM, no wifi. But the real discovery were the people living there. Everyone was so friendly and after a short while we already knew half the village. There was Reva who offered us some fruits and fresh eggs in exchange of some rhum, we met Veronique, who offered us bananas and oranges in exchange of some T-Shirts. And there was Anne and her husband Henry who gave us lots of pamplemousse and lemon and showed us the beautiful wooden handcrafts and Tikis they do. 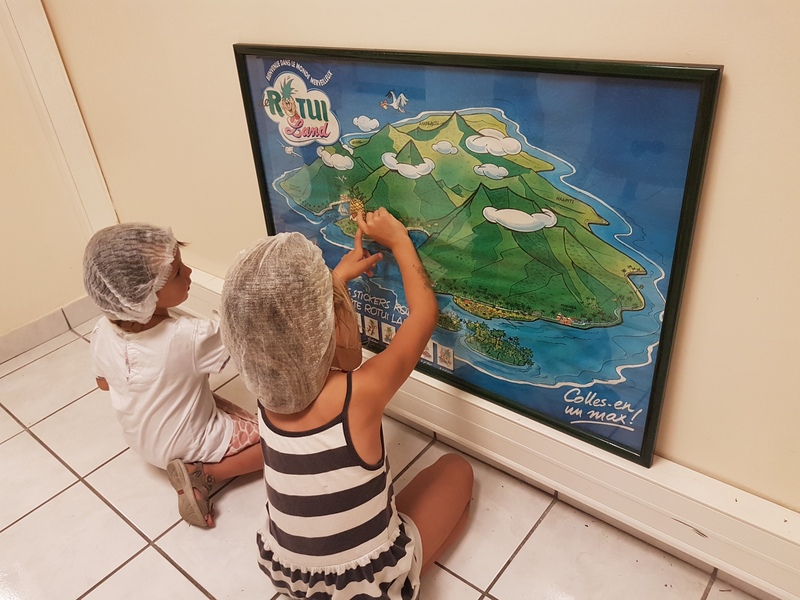 They told us about the “Salon des Marquises” in Papeete and that a lot of people from the village will go there with the “Aranui 5” boat in the following week to sell their artcrafts during that exhibition. With Anne we could also make a deal to have two bags of laundry washed and dried against two pairs of flipflop. She also told us that we should not miss church on Sunday morning 8 o’clock, as it was mother’s day and all the women will wear beautiful handmade flower crowns. For Saturday evening Max had organised dinner at Desirée’s place for all the boats in the anchorage and we spent a wonderful evening together. The church on Sunday morning was one of those magical unforgettable moments… the beautiful choir, the wonderful scenery and the smell of all those flower crowns was just a perfect blend. After the church we first chatted with some local people and then headed back to the port. There we met two local guys with a dead goat who had fallen off the steep rocks. We started talking with them and one of the guys – Christian was his name – offered us to prepare a dinner the next day at his place. We asked the other boats if they wanted to join and ended up in a group of almost 20 people eating delicious goat with coconut milk and papaya, raw marinated fish and fried breadfruit and rice. And so the days passed and we stayed much longer as we originally thought we would. André went spearfishing with Nico and Gavin from URCHIN, Simon proudly showed us his artcraft masterpieces, Florida explained us how to do tapas and Basil showed us how to make fresh coconut milk. André and me also did a beautiful hike to the village of Omoa. So there was so much to discover and we learned a lot about their way of living. After 10 days we left Fatu Hiva and sailed to Hiva Oa to officially clear in there at the gendarmerie. Our next stop was Tahouata. We anchored in a beautiful bay with a fantastic beach. After a few days CHASING STARS, INFINITY, ROGUE and some other kids boat catched up with us and the kids had a blast together at the beach playing with the big waves. After one week of sailing in the Pacific we arrived in Santa Cruz. With our agent Ronnie we had arranged a stay without autografico which means that we were not allowed to move to another island with Mirabella. Shortly after Ronnie had stepped on board the authorities showed up. André had to answer a whole bunch of questions and a female officer checked our pantry. Normally you are not allowed to bring fruits, vegetables or cheese. Our fruit reserve was down to a handful of limes and some coconuts. She did not really investigate thoroughly though. Otherwise she would have discovered my well treasured box with parmesan cheese at the bottom of the fridge… she left us the limes but took the coconuts and seemed to be pleased with that catch of the day. Santa Cruz turned out to be an excellent choice. On the watertaxi dock we could watch reef sharks, pelicans, seals and beautiful red crabs from very close and right after the watertaxi dock, there was a large playground for the kids. A stop at the small fishmarket was always a highlight, as you could watch there seals, pelicans and fregat birds from very close, lining up for getting some left overs. The beautiful walk to Las Grietas we even did twice because we really liked this magic place. On the way we passed a beach where iguanas where nesting. The refreshing swim in this crystal clear turquoise sweet water was fantastic. Near to the village there was also an interesting tortoise breeding station and the Darwin Center to visit. Paddling with the kayak in the bay to watch the Blue footed boobies or dive into the peaceful atmosphere of Laguna de las Ninfas was wonderful. So time passed very fast and we extended our stay. Our friends from INFINITY (from the Atlantic crossing) arrived and it was nice to catch up with them and spend time together as we have had different routes since Barbados. 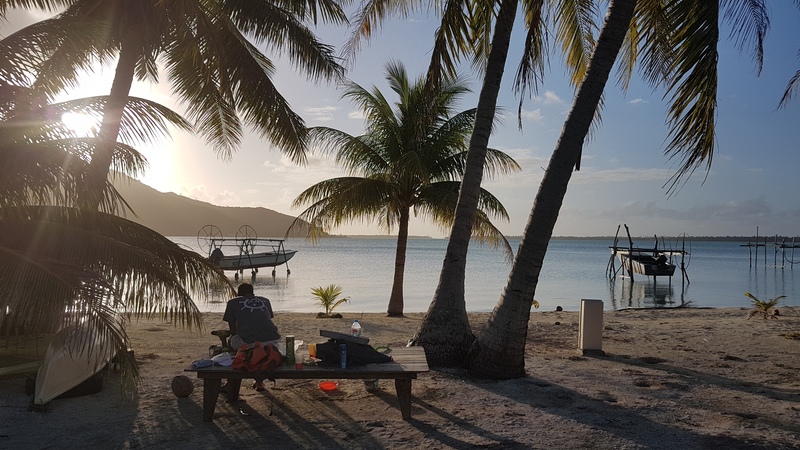 Although INFINITY wanted to convince us to leave a week later together with them and some other boats we found that after two weeks it was time to move towards the Marquesas. Jeremy organised a kind of Pacific fleet to track the boats crossing to the Marquesas and to have some kind of network, if anyone get’s in trouble. This Tiki fleet turned out to be a fantastic thing as it was always good to hear from the other boats with what they were up to during the passage. The Pacific ocean covers about 1/3 of the earth surface, this ocean is huge. I mean, all oceans are huge, but the Pacific is a league of its own. To sail from Panama to the Marquesas, the first islands of French Polynesia, is about 3800 Nautical Miles. One can add a stopover in Galapagos, but this leaves still 3000nm. Crossing the Atlantic from the Cape Verdes to the Caribbean is only 2100nm. We set sail from the La Playita anchorage in Panama City to the Galapagos on 19.April. For a variety of reasons this can be a challenging passage. The winds are often variable, with prolonged periods of calm weather. The equator crossing can bring another set of challenges. There are a high number of thunderstorms with lightning around the equator. On crossing the equator we also had the traditional equator cruising baptism. The skipper dressed up as king Neptune and everyone was baptized with a bucket of sea water. We followed up with a glas of champagne and homemade cake. For most of the passage from Panama to the Galapagos we had light head winds and we were making good progress. Leaving Panama bay we were treated with all the wildlife one can wish for. Pelicans flocks flew around Mirabella, Dolphins swam with us and an impressive school of 100+ eagle rays crossed our path. Two days out we sailed into an enormous squall. The wind shifted by more than 180°, torrential rain came down and lightning was all around us. The lightning was a bit scary and this was the first time when we put some of our electronics equipment into the oven to protect it from a potential lightning strike. All went well, Eva Maria took a rainwater shower in the cockpit and we discovered some small leaks on the deck. For almost all of the passage we sailed close hauled on a port tack. After a few nights we put pillows under the matrasses to neutralize the heeling. This actually worked pretty well. It was great to see the Galapagos islands show up on the horizon after a bit less than a week. After two weeks, in the evening of May 8, we left the beautiful Galapagos Islands. We really loved the Galapagos. The wildlife is unique and plentiful. When Jaël told us before noon what we have already seen today (seals, rays, sharks, pelican, crabs, turtle and tuna (ok, dead on the market) Amina said: Yes, that’s just how it is in the zoo. You have many animals. To clear out of Galapags was again a bit difficult. The entire crew had to go on shores so we got the necessary stamps. Then all back on the boat and again a boat inspection with 4 officials. All papers were re-checked. The same questions like at the clear-in were asked. Liferaft? Yes, we have. Where? Fire Extinguisher? Yes, we have three. Where? Please show? Radio? Satellite phone? GPS? How much diesel on board? Firearms? Etc, etc. In Martinique (France) I was able to do this alone on a computer. Duration 30min, costs 5 EUR for the official stamp. In the Galapagos it took 4 hours each, employed 4 officials on the boat and two on land. Costs for Mirabella and crew: USD 1,590! Well, we booked it on development aid …. At some point that was over and we left the bay with the beautiful name Ayora, plotted a course to Fatu Hiva, Marquesas and sailed towards the sunset. 3000 miles to go. To start with, the Pacific was good to us again. We had very pleasant light to medium winds. Our goal was to cross the Pacific (3000nm) faster than the Atlantic (2700nm). We should be able to do this thanks to two points: a) We should have better winds in the Pacific and b) We finally have a working spinnaker pole for our headsail. So we can pole out the Genoa, the Code Zero or the Gennaker. The boat speed remains about the same but one can sail dead down wind, keeping as close as possible to the rhumbline. The nights on Pacific were dark. Large parts of the pacific crossing was done with no or little moon. We left about a week before new moon. These were beautiful nights. It’s dark in the night like nowhere else. Lightpollution? Unheard of in the middle of the pacific. Other then our position light, there is no light source within 100km or more. So we can admire the starry sky in all its glory. We saw Milky Way from horizon to horizon. Beautiful. Mars shines strongly orange and outshines almost all. Scorpio, Orion, Southern Cross everything is there. Nobody else then the stars is there though. The Pacific is absolutely empty. In the Atlantic, we had at least occasionally a sighting. Mostly only electronically on the AIS because here the range wider. But here on the Pacific? Nobody in sight. Since Galapagos only us, fish, birds and stars. Throughout the pacific we were making great progress. Our daily run ranging from 175nm to 200nm. This is the upper end for a 48ft cruising yacht. We had good moral on board. Our extra crew, Mauro from Italy and Marine from France were a great help and very good fun. Seasickness was mostly overcome. We played Uno and Princes in the cockpit (with Sleeping Beauty, Snow White, Rapunzel, Aladdin, Frog Prince, Cinderella, The Beauty and the Beast and No. 8 I forgot). Amina always finds everything funny anyway. Besides putting on life vests, that always gives drama. The halyard exploded about half an hour before midnight. The wind had increased a bit and we were making good progress. The skipper was in bed when the Code Zero halyard exploded then it was suddenly very quiet, no more pressure in the rig, no more noise from the water. André! The Code Zero is in the water, Eva Maria yelled from the cockpit. So, get out of bed and inspect the damage in underpants. Yes, the Code Zero is in the water. Looks like depressing. In the middle of the night 100m2 sails swam next to our boat. At least no collision, that would be much worse. The halyard broke with aloud bang and all the glory came down. So: ‘All hands on deck’, we get some night action. It took usabout an hour to pull the whole sail out of the water and lash it fairly tight to the deck. Then we continiued under Genoa only, rather slowly, unfortunately. In daylight, we closly inspected the damage. The halyard probably broke because of a mix of old age and overload. We have two halyards for the Code Zero. Both were the same age and looked a bit doubtful. I replaced one halyard in Martinique. Since the meter price for top quality Dyneema ropes is about 13EUR, I have only replaced one of the 50 meter long halyards. Thought the other will probably have to hold a little longer. Well, it didn’t. The sail survived the nightly cleaning surprisingly well. We pulled it up again in the morning and it still looks great. Lucky Mirabella! The kids slept through the entire night exercise. That’s good too. The winds remained stable and mostly moderate throughout our entire passage. It was a dream to sail. We sailed a lot with the poled out Code Zero and the poled out Gennaker. During the day we fished, played cards, baked cakes, cooked and watched videos. Celebrated Aminas birthday! Things were going very well. We arrived after 16.5 days early in the morning in the bay of virgines in Fatu Hiva. 300 miles more and almost 5 days less than across the Atlantic. Looks like we are getting the hang of it. The bay of virgin in Fatu Hiva is spectacular! The muntains are high, the steep slopes are densely forested and alternate with rugged rock formations. King Kong is probably still living in the forest. We were ready for an unforgettable stay in Fatu Hiva. Shelter Bay Marina is a beautiful and peaceful marina surrounded by rainforest. The staff there is very helpful and the atmosphere very friendly and relaxed. Everybody is waiting for the channel passage and tries to help each other. On the second day after our arrival the measuring took place and with a little help from our skipper Mirabella measured 49 feet only and not more than fifty which saved us 500 $!! Our agent Erick told us that there had been a cancellation and he will try to put us in on April 10th. And indeed he managed to put us in. Next morning he confirmed the date. That was really fast!!! It was almost a pity that we had to leave so soon, because we met a lot of nice people like Tove and Rasmus from DIES NATALIS , Elena and Woytec with Paul from IMAGINE or Annemieke and Rob from CHARLIE II and just on the day of our departure INFINITY checked in – another boat from the Atlantic Odyssey. We haven’t seen them since Barbados and now we were both here in Panama! Jeremy told us that ROGUE would arrive on the next day, so we missed them. But hopefully we will meet again in Marquesas. The kids enjoyed the pool and Jaël trained her snorkelling skills. Finally Valerian also arrived in Shelter Bay Marina and joined the crew. So we could try out if it really would work to have three additional crew sharing a cabin or if it would be too much. For the canal we had to move to the anchorage in the afternoon. The advisor was meant to come at five p.m. and finally got on board at 6 p.m. Our advisor Ricardo was a very nice guy. Very friendly and calm, explaining everything very well. He supervised Osmane who did with us his 9th canal passage. Everything went very smooth. Audrey and Valerian took care of the line at the bow and Mauro was on the stern line. We were nested to another sailing boat. So we just needed to care about the two lines on our starboard side. So it normally works like this: the big fat guy has to get into the lock first and then they add some sailingboats nested together in a package of two or three just to fill the room. The big ships pay around 200’000 dollars for passing the canal. Around 10 p.m. we finally arrived in the Gatun lake and stayed at a huge buoy for the night. 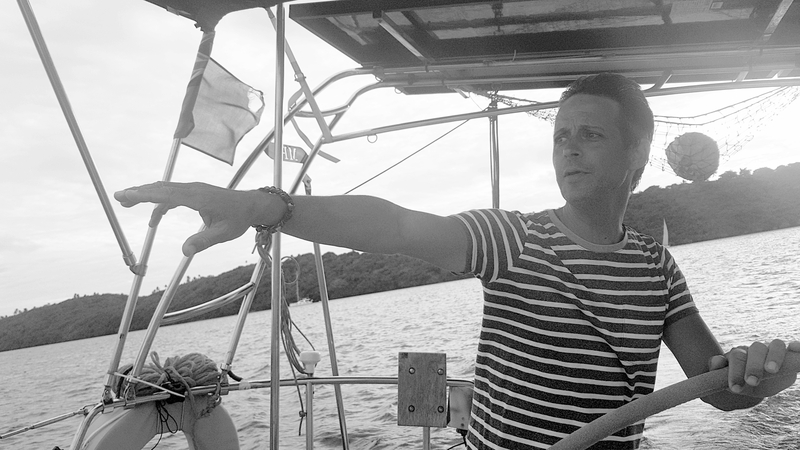 Next day at 8.00 a.m. our new advisor Edwin came on board and we started motoring throught the Gatun lake. In front of the Miraflores locks we had to wait for our nesting partner. This time it was a catamaran. His name was CHASING STARS and they had 5 girls on boat! So Jaël was very happy when she was invited to go on their boat after we were rafted together. She came back just shortly before the doors of the last lock were opening and Mirabella floated into the Pacific. We met CHASING STARS again in the anchorage after the canal and we are looking forward to meet them again in French Polynesia. We wanted to move to the fuel dock but our anchor was stuck… first she tried to dive down to the anchor and check out what the problem was, but as the water was really murky it was very difficult for her to see or do anything. A French couple of another boat saw that we obviously had a problem with our anchor and offered us their complete diving equipment. That was so generous and saved our day. So Marine put on the diving gear and dived down. Our anchor chain was wrapped around some kind of metal thing. Marine could sort it out and so we finally could take the anchor out. Well done Marine and welcome on board! We left Martinique under perfect conditions. The new spinnaker pole was absolutely worth the waiting. Thanks to the pole we were able to sail in a direct line towards our waypoint without jibing in a zigzag line as we had to do on our Atlantic crossing. The 450nm mile crossing took us less three days to arrive in beautiful Bonaire. The colour and crystal clearness of the water there is just amazing. We stopped in Bonaire to await a weather window for the Columbian cost. The Columbian cost is notorious for its fierce winds and a sailor often is faced with more the 30kts of wind. Many of our cruising friends encountered strong winds here and some of our crew said that there is never less than 30kts here. The waiting turned out to be a success on many aspects. Bonaire was really a fantastic place to stop. We went to a nice restaurant on Sunday night and met a family from Germany on a boat called HUMMEL. Jaël and Gesine, their girl, got along well together right from the start and we decided to go snorkelling together the next day. So we checked out Klein Bonaire by snorkelling. It was the best underwater world we had seen so far in the Caribbean! All sorts of beautiful corals and a lot of coloured fishes. Finally we stayed 5 nights in Bonaire. By then the wind around the cape of Cartagena had calmed down. We had perfect conditions! Sailing from Bonaire to Panama with no more than 20tks of wind, very enjoyable, unusual conditions. The weather routing worked out perfect. We decided to go to Panama first and do the San Blas Islands only if we would have to wait longer for the channel passage. Thanks to the excellent planning with the stop over in Bonaire and our fantastic new crew members Mauro and Audrey the crossing of the Caribbean sea turned out to be the most relaxed passage so far. The skipper was happy about the fast passage and I enjoyed the comfort that Jaël and Amina had two additional crew members to play with.